HEAVY DUTY AND ROBUST - Made of high grade brass and stainless steel. This nozzle is designed to last. Robust brass construction is much stronger than plastic water nozzles. The brass gives it a strong durable finish that looks attractive and does not rust. EASY TO USE - There is no painful trigger to pull, and the soft rubber grip is easy to turn on and off. 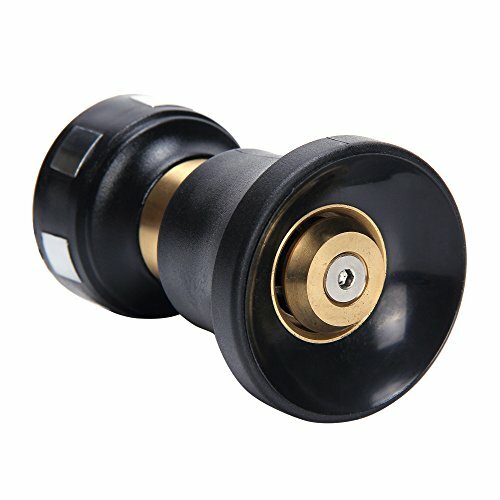 MANY USES - Use this nozzle to wash your car, truck, rv and boat. Water your garden, lawn and flowers. The uses are endless for this strong, durable, heavy duty hose nozzle. UNIVERSAL - Fits any standard USA harden hose thread. (5/8" or larger recommended for optimal performance) WARRANTY - Every StrudyStream product enjoys a 12-month worry-free guarantee & 30 day money back guarantee. HEAVY DUTY AND ROBUST - Made of high grade brass and stainless steel. This nozzle is designed to last. Robust brass construction is much stronger than plastic water nozzles. The brass gives it a strong durable finish that looks attractive and does not rust. EASY TO USE - There is no painful trigger to pull, and the soft rubber grip is easy to turn on and off. MANY USES - Use this nozzle to wash your car, truck, rv and boat. Water your garden, lawn and flowers. The uses are endless for this strong, durable, heavy duty hose nozzle. WARRANTY - Every StrudyStream product enjoys a 12-month worry-free guarantee & 30 day money back guarantee. If you have any questions about this product by Sturdy Stream, contact us by completing and submitting the form below. If you are looking for a specif part number, please include it with your message.